During Prince Harry and Meghan Markle’s touching marriage ceremony, cable hosts and invited “experts” still called his parents’ nuptials “the wedding of the (20th) century.” Among the embarrassing lack of research (identifying celebrity guests but not most of Harry’s extended family or cellist Sheku Kanneh-Maso and the music he played), the worst was insisting that the July 1981 wedding was romantic. Both then and now, the event watched by millions reveals a very nervous teenager who on that day became so famous that she would be known by her first name. 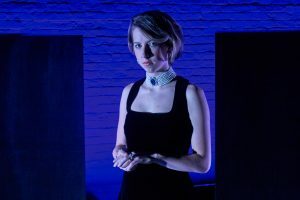 A defining chapter of Diana’s life is the subject of James Clements’ one-act play, The Diana Tapes now at HERE. The story is known but Clements succeeds in creating tension and mystery around a troubled woman whose life was so public. With an insightful, balanced mixture of fact and creative nonfiction, Clements and his What Will the Neighbors Say colleagues dramatize events leading to the 1992 publication of Diana: Her True Story-in Her Own Words. Clements plays Andrew Morton, the royal-watching working class reporter chosen by Diana (Ana Cristina Schuler) to write her memoir. Morton provides updates on his assignment to Dr. James Colthurst (Jorge Morales Picó), the Princess’ longtime friend. The book’s progress is chronicled in a series of clandestine meetings between Morton and Colthurst and Colthurst and Diana, with Morton’s American agent Michael O’Mara (Sam Hood Adrain) enthusiastically monitoring its progress. Because there are no scenes with Charles, “that woman” Camilla Parker Bowles, or the rest of the Windsor clan, the focus – and sensationalism – is on the book. Questions for the Princess are sealed in an envelope Colthurst delivers in person to Kensington Palace. (Morton and Diana never interact onstage.) Diana tape records her answers. Morton hand writes his notes. O’Mara secretly publishes the manuscript in Finland. By showing rather than explaining, this would have never worked with the Internet or social media. That’s plenty for director Wednesday Sue Derrico to work with, since Diana’s cooperation proved difficult. Schuler make her sympathetic and understandably vindictive, but no saint or feminist icon. She and her onstage subjects convey that while Diana was a successful human rights advocate and mother, she was also a master manipulator. Clements and Morales Picó are believable as collaborators whose only mutual interests are Diana and her story. Their pointed class differences are played up because they illustrate the deep divides of post-Thatcher England and the Princess’ wide-scale popularity. Adrian’s O’Mara provides solid, and occasionally comic support, as the outsider and voice of reason. The Diana Tapes is a smart variation on the Diana myth. The only thing Clements doesn’t answer is what happens to Andrew Morton and Dr. Colthurst. Both become famous themselves as Diana experts. Morton’s latest book about the Royals is Wallis in Love, a speculative biography of the American divorcee Edward VIII abdicated to marry. That’s minor considering the subject. Diana gets her divorce and keeps her children. She never lived to see Charles marry Camilla or become, in public, a caring parent. (Compare William and Harry with the Grimaldis of Monaco.) Her sons continue her charity work and freely married educated (Kate, St. Andrews, Meghan, Northwestern) women more aware of the life they were entering. The Diana Tapes ends with the tiaraed HRH standing between two full-length mirrors wearing Madeline Wall’s perfect recreation of a black velvet Vivian Westwood gown. Ana Cristina Schuler resembles Diana slightly but, more importantly, represents her complicated legacy. As Schuler’s voice is heard speaking Diana’s words, she smiles serenely. On this stage, in her book, and at her youngest son’s wedding, she got the last word. The Diana Tapes opened May 27, 2018 at the Dorothy B. Williams Theatre at HERE (145 Sixth Avenue, NYC) and runs through June 10, 2018. See the What Will the Neighbors Say? website for information on the production and HERE’s show page for tickets. As performances are selling out, please call the box office at 212-352-3101 to enquire whether there is a wait list or standing room tickets available at the door. Tagged HERE House of Windsor Margaret Thatcher Mrs. Simpson Princess Diana Royal Family The Duke and Duchess of Windsor Vivian Westwood What Will the Neighbors Say?